It had actually been three and a half months since I last made scones, and that’s kind of a long time. Every scone recipe looks good to me, and I found five of them in Vegetarian Classics . The ginger cream and the double almond were very tempting, but I chose to make the Irish wholemeal scones first because they sounded kind of healthy. They look like healthy scones too, don’t you think? Of course, they’re not health food of the strictest variety given that they have a good dose of butter in them. The author, Jeanne Lemlin mentioned some scones she had in Skibbereen, County Cork that were like Irish brown bread. She set out to re-create them at home using whole wheat flour which is the closest we have to Irish wholemeal flour. Hopefully, my friends in Dublin can let me know if these look like authentic Irish scones or not. They’re made with unbleached flour, whole wheat flour, oats, and wheat germ. A scant two tablespoons of sugar sweetens them just enough, and butter, buttermilk, and one egg give them rich flavor. I had a small handful of currants leftover from another recipe, so I added them to the scone dough. 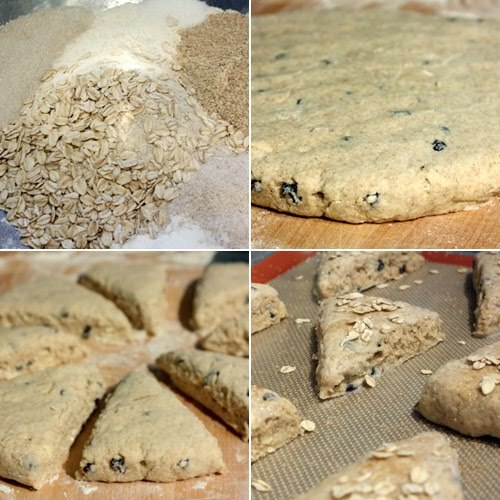 The dough was patted into a disk, and it was to be cut into 12 triangular scones. I may have left the disk a little thicker than I should have, and 12 cuts would have made rather slender scones, so I went with eight larger ones instead. The tops were brushed with milk, and I decided to sprinkle on some extra oats and a little turbinado sugar just for the added visual appeal. The oats on top give them that healthy look. Scones and muffins are Kurt’s favorite things for breakfast because they’re very grab and go. He liked that these were only lightly sweetened, and the combined flours, wheat germ, and oats gave them an almost nutty taste. They were light and tender, and if you take the time to sit down with one of them, they go very nicely with strawberry preserves. It won’t be long before I try the other scones in this book or recipes from elsewhere, but I’ll definitely be making these again too. They look very tempting and delicious! Your scone looks really nice. I like the addition of oats! It seems perfect. Lovely scones! I am adding these to my list of recipes to try. My husband loves them, so I've got to try them for myself. wheat germ is such a nice addition. Yum, your scones look delicious and I love oats in them! 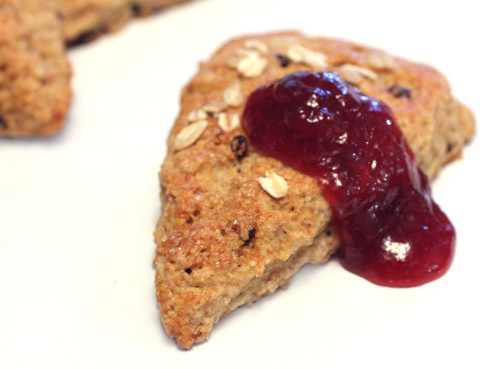 The scones with oats and whole wheat are definitely the top choice for the breakfast! 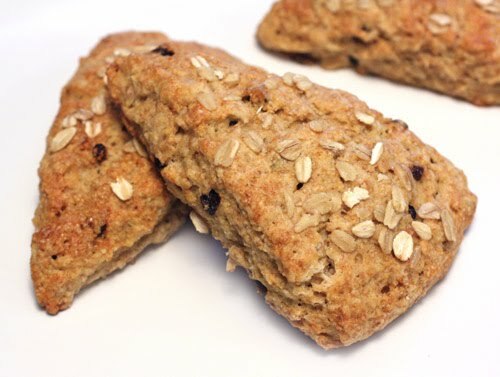 I have a few recipes from Irish cooks & these are the real wholemeal scone!! It's been a while since I last made scones too. These look amazing. The image of the gooey jam dripping down the side of a flaky scone will stick with me for the rest of the day, I'm sure. Beautiful scones Lisa,love them. Also love the healthy mix of grains & the great visual effect! YUM! Oh they look pretty good from where I'm sitting :) For me, brown scones are just like wholemeal bread - I usually wouldn't sweeten them at all as I generally get all of the sweetness I need from the jams that I load on top! I also love having some oats thrown into the mix. Any chance you could send some my way? Haven't made scones for such a long time. They look so perfect Lisa. Very healthy indeed and lovely looking. They turned out perfect. I love your pictures, so vibrant and colorful, especially that southern stew a few blogs down. What a delicious breakfast! They look fantastic! How timely! Just when I was thinking abt how much I miss scones...you offer a wholesome, healthy version of it! Thank you, Lisa! Health food or not, we love scones! Anytime! These look particularly yummy! Yum - these look great. They look quite healthy - can I still claim they're healthy when I smother it with cream and jam? If it's buttery and carby, we are fans! They certainly sound healthier than normal scones although that butter will get you. Good to know they come out tender too. I love scones! Oh, I love these! I haven't made scones in a long time--need to get right on that! this looks healthy and yummy! Gorgeous. I love scones, but X doesn't, so if I make them, I end up eating all of them...which really isn't a bad thing. I love that these are made with a mix of flour and oats -- sort of like the oatmeal cookie of scones!